This entry was posted on September 20, 2010 by Phil Groom, in Christian Suppliers, News and tagged Biblica, Operation World, Prayer, STL Distribution, STL UK, World Mission. Bookmark the permalink. LESS THAN A YEAR after the UK Christian book trade was plunged into turmoil by Biblica’s decision to pull the plug on its UK operations, STL UK’s new owners, who picked up the pieces in Carlisle in the wake of Biblica’s pull out, have announced an exclusive UK trade representation and distribution deal with Biblica Europe for the forthcoming 7th edition of Operation World alongside an exclusive UK distribution agreement for Biblica US titles. Although Biblica’s international leaders have yet to publicly acknowledge or show any signs of repentance for the damage they caused not only to the UK trade but, more importantly, to individual lives and livelihoods, this new trading relationship must surely be good news and a sign of hope as trust is slowly rebuilt in the trade: congratulations to all involved at STL UK on showing sufficient grace to broker this deal. May it open the door to a new era for the entire trade. STL Distribution and Biblica Europe have signed a new agreement which will see STL Distribution acting as the exclusive sales representative and distributor to the UK trade for the new edition of Operation World. 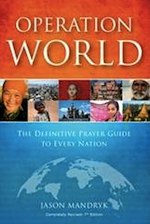 With over 1 million copies of past versions sold, this fully updated and revised 7th edition is the must-have definite [sic] guide to praying for the people and nations of the world. Featuring a daily prayer calendar, maps, political, economic and religious information on each county, along with answers to prayer, this eagerly anticipated resource will be published 15th October 2010.